Our go-to casual food favorites are almost as comforting as Linus’ constant blanket companion. 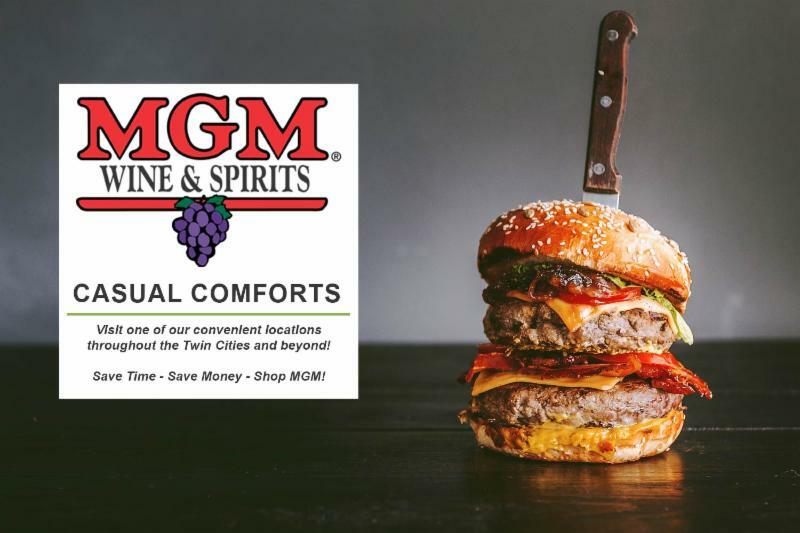 And pairing pizza, burgers and Mexican fare with your favorite beer makes it even better-but there are also many wine options that make fast friends. For a classic beer with pizza, American pale ale, India pale ale (IPA) and pilsner are overall delicious matches. And whether you favor trendy or traditional toppings, wine can claim a piece of the pie as a delicious companion to pizza-the key is to either counterbalance or complement the dominant flavors of the toppings and sauce. Pepperoni: The classic pizza with tomato sauce and mozzarella cheese topped with pepperoni calls for wine with lower acidity levels since the tomato sauce is acidic on its own. A wine that is also fruit-forward works well with the tomato’s sugar and acid combination. Reds to try: Chianti, made from the Sangiovese grape, is a classic match for this pizza, as are California’s wines made with this grape. Cabernet Sauvignon can stand up to the pepperoni but won’t overwhelm the cheese, and it also works well if mushrooms are added to the mix. The light acidity of Beaujolais can counterbalance the rich cheesiness as well as the spice. Whites to try: Pinot Grigio or Pinot Gris can refresh after the pepperoni’s spiciness and also herbaceous Sauvignon Blanc. Prosecco, the fruity yet dry lightly sparkling white wine from Italy balances the tang of tomato and also cleanses the palate after a cheesy bite. Meaty Medley: Like a flavorful mix of pepperoni, sausage and bell peppers or sausage and mushrooms? Reds to try: Made with the Negroamaro grape, Salice Salento is usually a heavy spicy Italian wine that may overwhelm a plain pizza, but it is big enough to tackle this flavorful combination. California Zinfandel or Aussie Shiraz’s zip complement hearty sausage and earthy mushrooms. Whites to try: Full-bodied toasty Chardonnay can stand up to the sauce and the richness of the cheese plus sausage, mushroom and the sweetness of onions. Vegetarian: Green pepper, black olives, mushrooms and onions up your alley? Reds to try: Pinot Noir won’t be overpowered by the flavorful mix-plus the wine’s earthiness harmonizes with the mushrooms. Whites to try: With its herbaceous quality, Sauvignon Blanc nicely matches the green pepper and mushrooms. Canadian Bacon and Pineapple: Sweet and salty your game? Reds to try: Beaujolais’ fruity quality is a tasty companion with the pineapple. Whites to try: Sauvignon Blanc harmonizes with the pineapple and offers a good balance with the savory ham and cheese. An off-dry Riesling will also do the trick. Nontraditional or “white” pizza: Made without tomato sauce, this has a milder flavor base and opens up more unusual topping options-and the wines to go with them. Chicken, oysters, sprouts, eggplant, Cajun shrimp, artichoke hearts, or even duck may find their way atop trendy pies. And even some of the larger chain pizza delivery restaurants feature chicken, spinach and various other alternative toppings these days. Whites to try: Alsatian Pinot Gris or an Austrian Grüner Veltliner with artichoke or asparagus-topped pie. Sparkling wine, Sauvignon Blanc, and Pinot Grigio also work well with these “designer” discs. And pizza and Champagne? Give it a try — the yeastiness and effervescence make a good team and work well with pizza’s saltiness. The toppings on your burger come into play when making matches. Pickle relish and yellow mustard: White Zinfandel’s soft and fruity characters offer balance. You may also like sparkling wine. If sweet pickle relish is on its own, try Gewürztraminer. Avocado, cucumber, and sprouts: Sauvignon Blanc for white wine fans; Merlot for fans of red. Bacon and cheddar: Rioja has its own smoky flavor that goes with the bacon. 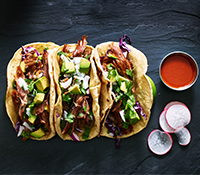 Margaritas and beer (think light lagers or hefeweizen) are the usual suspects when you think of matches with Mexican food, but wine can certainly dance with any salsa. In general it’s best to avoid full-bodied, oaked and tannic wines so skip the oaky Chardonnay and high-tannin Cabernet Sauvignon with your south-of the-border favorites. Rosé is a good all-around complement. Reds to try: Beaujolais, Spanish Rioja, Italian Chianti, Pinot Noir, Merlot, Shiraz and Zinfandel-especially with the rich, earthy flavors of mole and chipotle sauces. Whites to try: Albariño, Sauvignon Blanc, Pinot Gris, Torrontés, Gewürztraminer, dry Riesling and Viognier-especially with green sauces. Easily make your own pizza for a fun dinner option and customize it with everyone’s favorite toppings. Starting with ready-made dough makes a quick-and-easy “semihomemade” option. 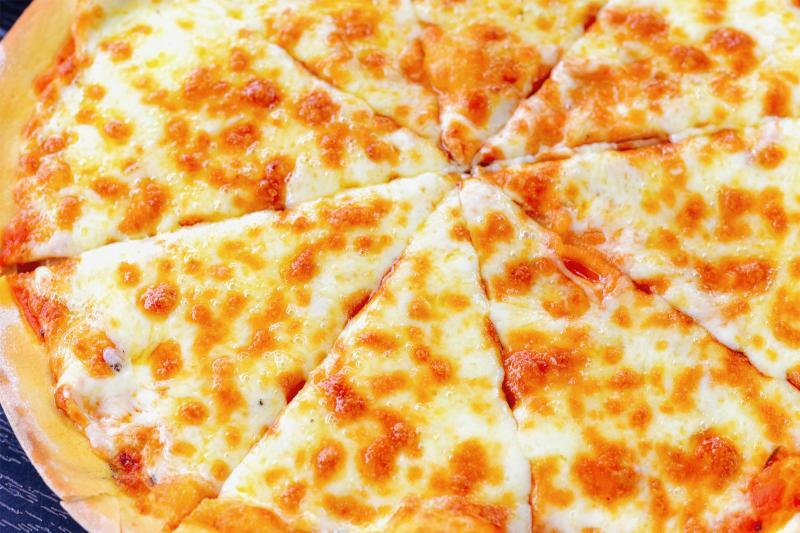 Here, three cheeses combine to make this deliciously easy pizza. Use the cheeses suggested or three of your favorites. Then mix it up with your favorite toppings. Spray counter lightly with non-stick cooking spray. Combine rolls together and roll into a 13-inch circle. Cover with plastic wrap and let rest 15 minutes. Remove wrap and place dough on a sprayed 12-inch pizza pan. Top evenly with pizza sauce or crushed tomatoes, Combine cheeses together and sprinkle evenly over sauce. Sprinkle with Italian seasoning. Bake at 450°F 10 to 12 minutes.